Automatically sync your WooCommerce customers with your SendinBlue contacts. Allow customers to subscribe to your newsletters and marketing emails. Send transactional emails (order confirmations, shipment notifications, etc.) and marketing emails (newsletters, sale alerts, etc.) with optimized deliverability. Segment contacts based on their purchase behaviors by integrating your WooCommerce transaction data with your SendinBlue contacts. Use SendinBlue’s powerful, intuitive design tools to create emails that are beautiful, effective and mobile-friendly. Send transactional and marketing text messages (SMS) directly from your WooCommerce dashboard. Monitor the most important email metrics: delivery, open and click rates within your WooCommerce dashboard. Install the plugin through the your WordPress site’s Plugin page. Go to “Plugins”, then “Add New”, and search for “WooCommerce SendinBlue”. Select the “WooCommerce - SendinBlue Add-on” and follow the on-screen directions to install it. You can also download the plugin and install the file directly on your server. Next, activate the WooComerce SendinBlue Add-on. Go to “Plugins”, then “Installed Plugins” and select the “Activate” option. Finally, go to the WooCommerce tab, then “Settings”, and click on the SendinBlue tab (next to the API tab). Follow the on-screen instructions to create a free SendinBlue account, locate your SendinBlue API key and add save it in the “General” tab. Enable a double opt-in subscription process, if desired. Select the double opt-in confirmation Template double opt-in to send. You can also update the template from your SendinBlue online dashboard. Enable the email opt-in field on your WooCommerce checkout page, and edit its label and position on the page. 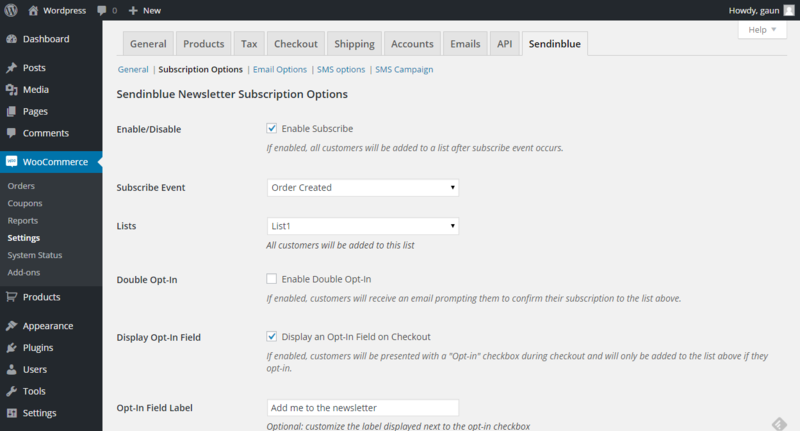 Once “Enable Subscribe” is selected, contacts that subscribe to your newsletter will be automatically synced with SendinBlue. 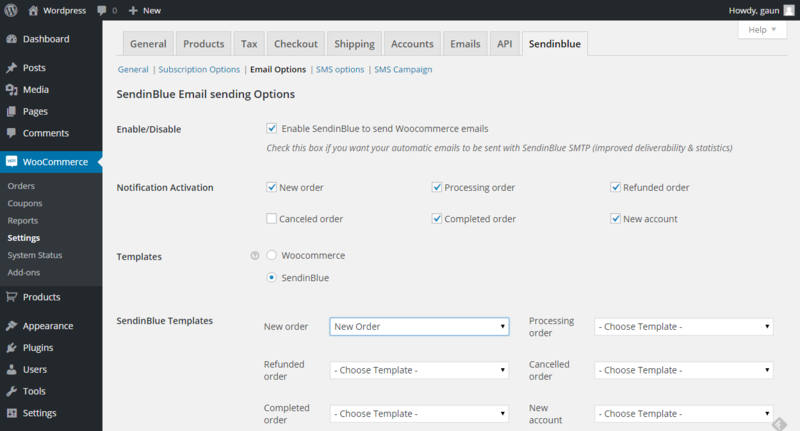 Navigate to the “Email Options” tab to allow SendinBlue to send your WooCommerce emails and select which events trigger an email (New order, Processing order, etc.). Once enabled, all WooCommerce emails will be sent using the SendinBlue SMTP server and your messages will be optimized to reach the inbox! And, you’ll have real-time access to the most important email metrics directly in the WooCommerce SendinBlue Add-On. Select the triggers for sending emails to your customers as well as the email template used for each. Navigate to the “General” tab in the SendinBlue Add-On (or to “Statistics” in your SendinBlue account) to review your email report. You will be able to see whether emails were received, opened and clicked, and adjust the time period for your report to review a specific timeframe. You can configure transactional text messages in the “SMS Options” tab and select whether to send an SMS confirming the order and/or when the order ships. 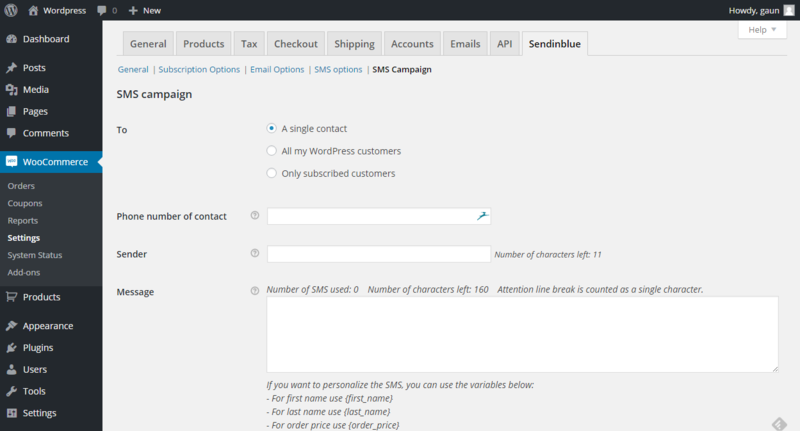 You can also send a SMS marketing campaign directly from the SendinBlue Add-On within the "SMS Campaign" tab. Create your campaign and select your desired recipient(s): a single contact, all contacts or only WooCommerce contacts who opted into your campaigns during checkout. Once sent, you can review your SMS campaign report from your SendinBlue online reporting dashboard.